Here's your chance to take Scooter the Cougar with you! We want you to snap a picture with Scooter — on vacation, at work or hanging out around town — to share with fellow students, alumni and friends. 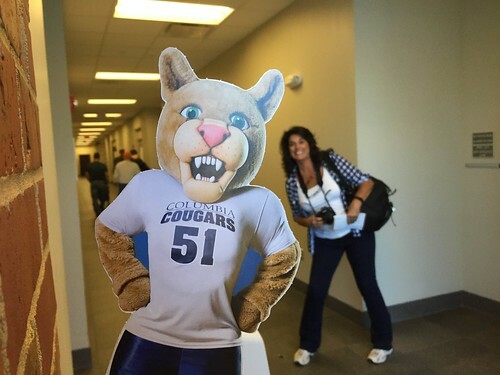 Don't forget to wear your Columbia College gear to show your Cougar pride! Scootergraph submissions are added to our digital album and may be published in Affinity magazine. Tag your social media posts with the hashtag #Scootergraphs. Submit a Scootergraph: Show us where you have taken Scooter lately! Get started. Request a Scootergraph: We're happy to mail you a complimentary Scooter cut-out. Click here. By submitting a photo, you certify that you own the photo or have the right to permit Columbia College to use and publish the photograph, and that you understand that all photographs submitted to Columbia College may be published, used or distributed in print, electronic or other media. Columbia College reserves the right to reject any photographs.